As a young and successful trainer-owner, Tony Michael Gattellaro certainly wouldn’t mind adding some more winner’s circle trips to his resume. He’d also love to see more people his age doing the very same. With snow blanketing the ground and the mercury dipping to -30 Celsius in the Greater Toronto Area over the last couple of days in January, thoughts of horses galloping over the Woodbine Tapeta and turf might seem miles away for most. When he returns to the Toronto oval, he’ll have new additions to his barn – which currently stands at 30 – on the Woodbine backstretch. “Last year was an interesting one for my stable,” noted Gattellaro of a campaign that yielded 11 wins and $402,537 in earnings. “I refer to it as a transition year. Being a younger trainer, I didn’t have an abundance of two-year-olds in past years. Last year, when we started, of the 24 horses I had, 12 were two-year-olds. So it was a challenge because you need patience. It’s very time-consuming to develop the young horses properly and not have much racing action. 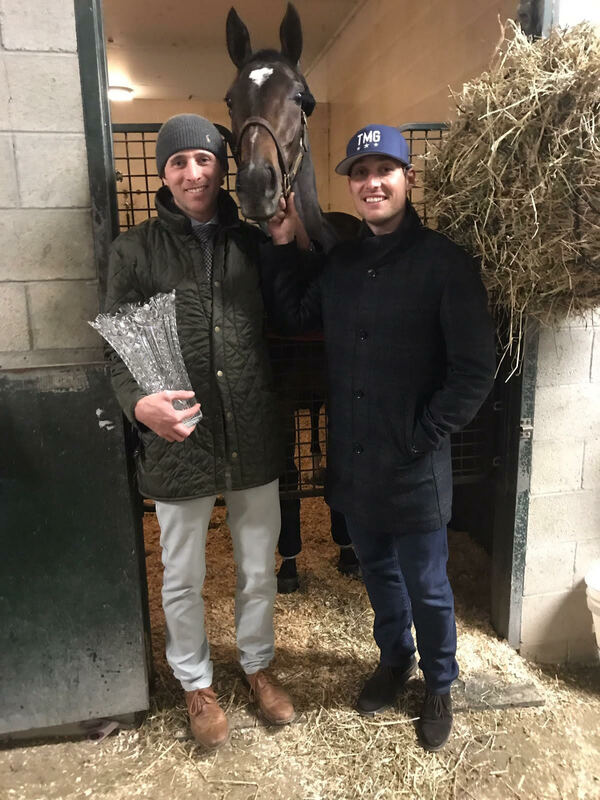 At age 33, Gattellaro, who has 32 career wins (since 2014) as of February 4, has stamped himself as a bona fide up-and-coming talent, a horseman committed to his craft, and to heralding the thrills of racehorse ownership to others. Owning thoroughbreds continues to be an integral aspect of Gattellaro’s racing philosophy. Last season, horses he owned in partnership recorded 22 top-three finishes from 38 starts. What advice would he offer to people pondering racehorse ownership? Throughout his time in Florida, Gattellaro has soaked up the horse racing scene at various cities and venues, including one of the biggest days on the North American racing calendar. “I went to the Pegasus World Cup and it was great to see. It’s an amazing event for young people and for those who might not have been to see a horse race. The events, the big races – it’s a fantastic way to encourage the younger generation to discover our great sport. With more eyes on his barn and an increasing list of owners seeking his services, life is indeed good for Gattellaro, whose biggest win (as a trainer and co-owner) to date came when Clickity Clack won the 2017 edition of the $225,000 Princess Elizabeth Stakes, with a group of his high school friends. He’d also appreciate seeing a younger generation of fans at the racetrack, and having them consider an opportunity to get involved in the sport. Gattellaro certainly knows all about that.